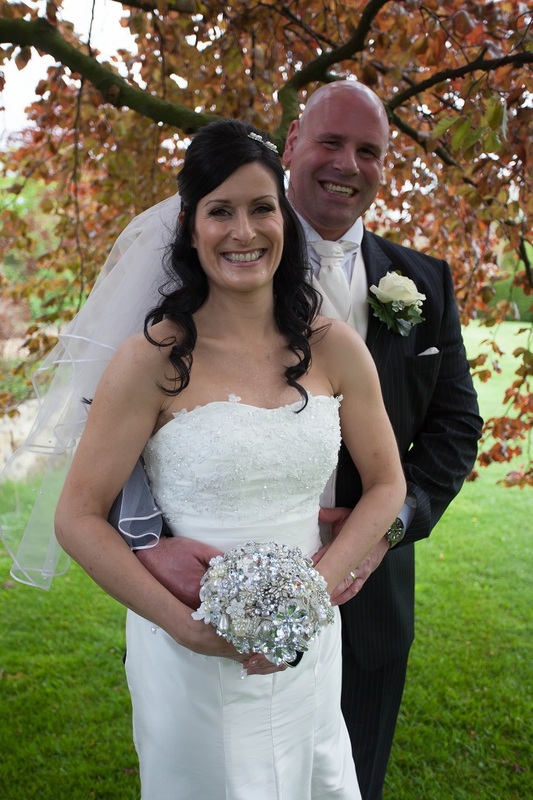 After running her own floristry business, Rachel Quinn knew that own her bouquet was going to have to be something spectacular for her wedding to Karl Weightman. The couple celebrated a 17-month whirlwind romance by tying the knot with a glamorously vintage pearl and lace themed wedding, with a bouquet that was fabulously out of the ordinary. 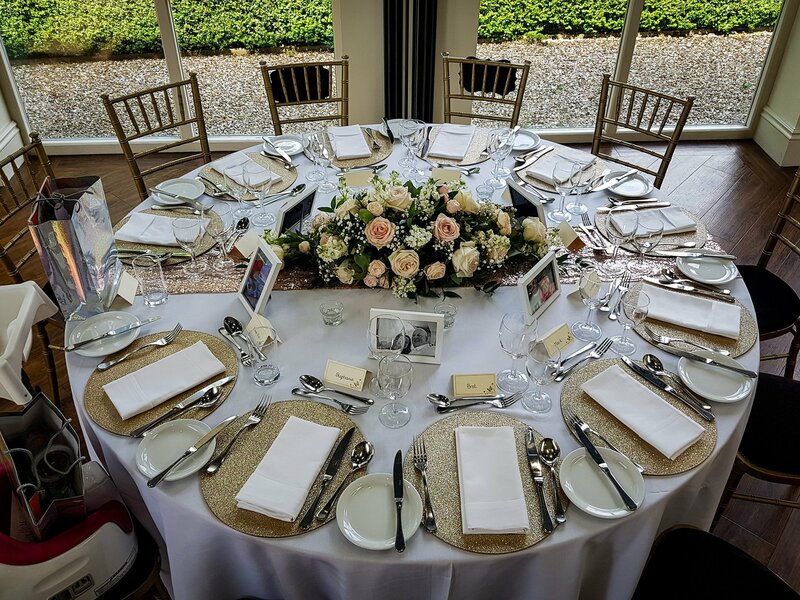 And while Rachel, 41, now an estate agent, and Karl, 38, an area sales manager, wanted their wedding to be quite traditional in some aspects, in others it was the far from traditional. We met via internet dating. It might not sound like we have been together a long time, but there was such an instant connection that we haven’t looked back. Those people who used to say: “You’ll know him when you meet him” seemed to know what they were talking about after all! For some reason – which I’ll never know – Karl decided to pick Halloween, thinking it would be memorable. I suppose it did work quite well as he had completely thrown me off the scent. He did try and get a pumpkin, and carve out ‘will you marry me’. I would have hated to see the state of our kitchen after that. But instead he took me out for a meal, and when we got home, he gave me a bowl and innocently told me there were some sweets in it that I liked. So I delved down and found a ring, and he got down on one knee. It was a big of a strange combination, but it was actually a really thoughtful way to propose, because he knows I’m a big kid at heart. He had already asked my Dad for my hand in marriage, which was really important to me. We got married on the May 11, 2013. 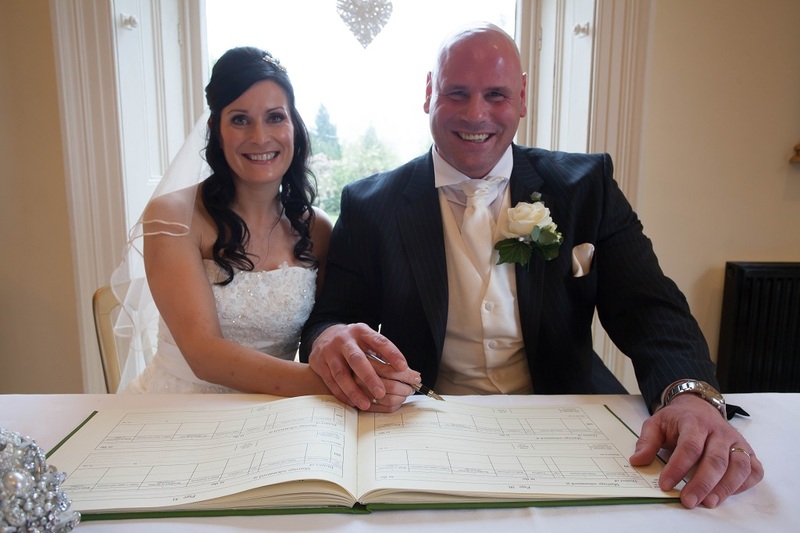 We chose it because 11 is quite significant to us, as it was the day of our first date, and we have lots of loved ones who have birthdays on the 11th too; so we felt really lucky when Shottle Hall offered this date to us. We also choose it because we thought it was our best bet at good weather. My sister got married on the same weekend 25 years earlier, and she had beautiful sunshine all day. In the end it was quite mixed, but not bad overall. 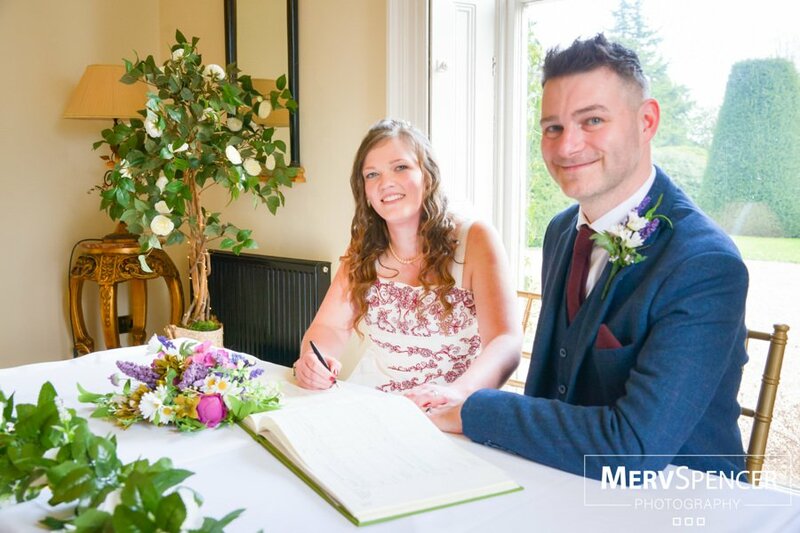 After having my own floristry business for six years, I had heard of Shottle Hall through the industry; so when we decided we wanted to get married at a secluded location in Derbyshire with beautiful views, we knew where to come. 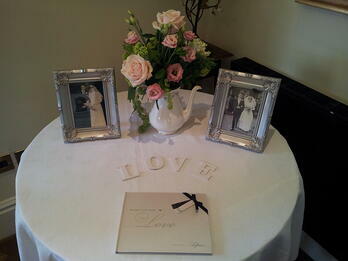 They were also very accommodating considering we only had six months to plan our wedding day. We also loved how intimate the venue was. 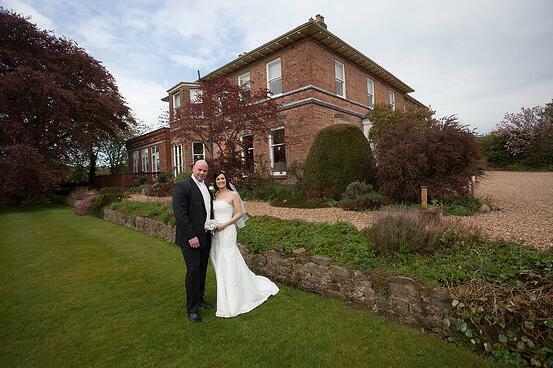 As we had guests staying on the wedding night, we were able to book out the rooms too. 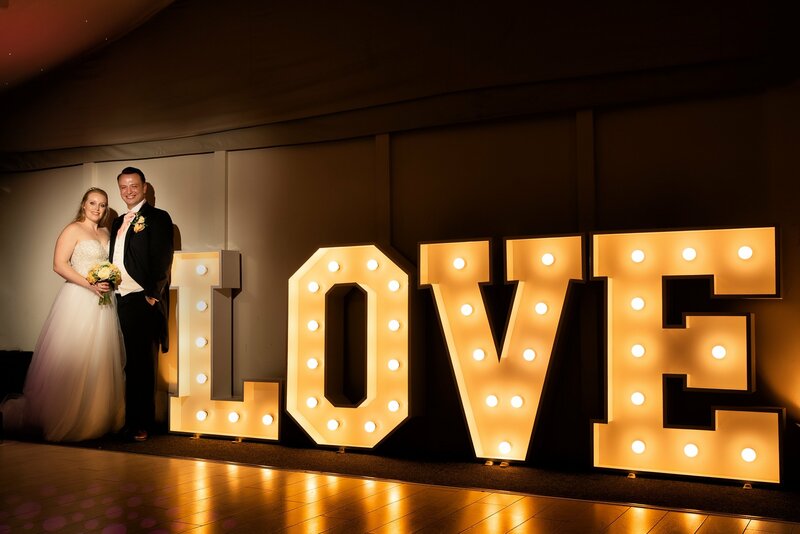 Shottle Hall were very accommodating when we were adding personal touches everywhere, like little wooden love heart signs to hang on doors, that were co-ordinated to the different colour scheme of each room. My dress was ivory and strapless. It was quite fitted, and had a small train, and some lace and crystal detail on the bodice. Apart from that it was quite simple really. 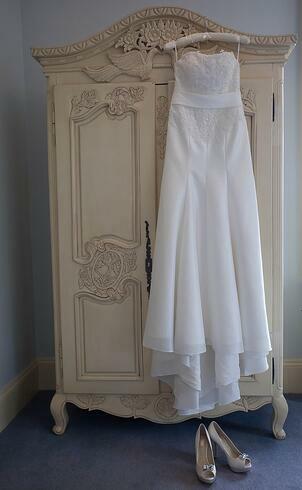 I went to one shop, Christine at The Bridal Lounge in Ripley, and it was the second dress that I tried on. I had my hair part up, part down. I’ve got dark hair and that’s what suited me most. I had a veil at the back, with a little clip at the side, so I just had a little ‘bling’ from the front. I had my makeup done by a professional who used silicone based make up. 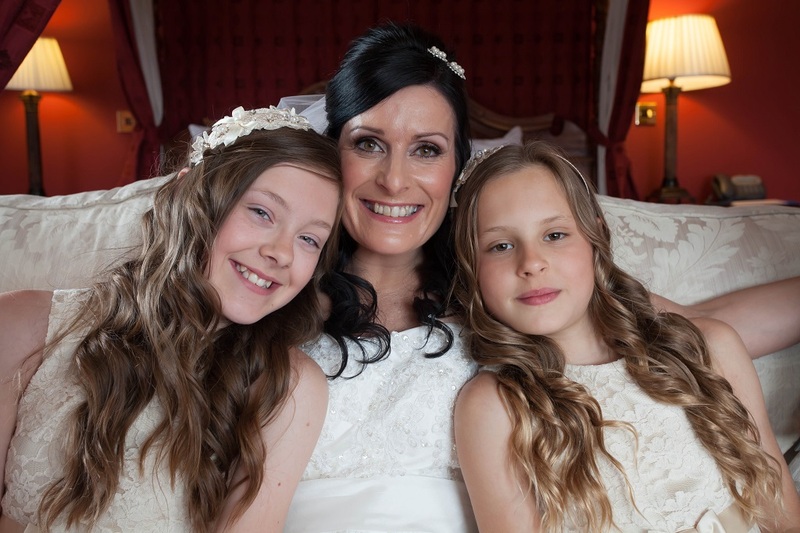 I thought it was fantastic and it suited my skin so well, and made a really flawless finish - which is exactly what you want on your wedding day. Not to mention it stayed on perfectly all day. I had two bridesmaids. One was 12, called Lauren, the other, Lilac, who’s nine. They are my nieces, so that was an easy decision. They had adorable little champagne coloured ankle length dresses, in quite a simple style, with lace on the top and a chiffon overlay skirt. The best man was Karl’s best friend Mark, who he has known for 33 years. They go as far back as primary school. We also had a little page boy, who was my ten-year-old nephew, Adam. The groom’s party were in suits rented from Slater’s in McArthur Glen. I wanted to throw the people who were guessing what bouquet I was going to have. With me being a florist, everybody wanted to know what I was going to do. Although I’ve done lots of beautiful bouquets over the years, when it comes to yourself it’s really difficult to know what to choose. 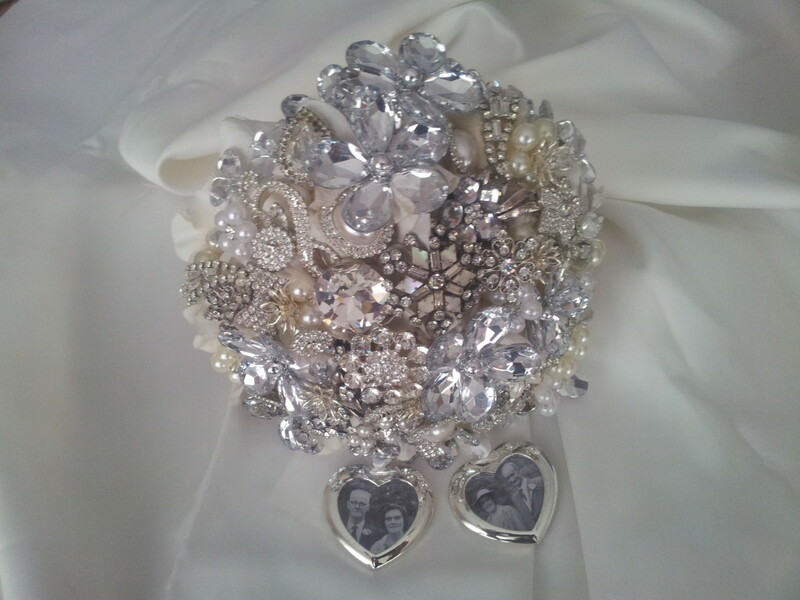 That’s when I came up with the idea of a brooch bouquet. I made it myself, with a collection of brooches: some were my mums, so they had lots of sentimental value, and others represented memories, like the few I bought from my hen party. The rest were made up from personal bits of jewellery, like earrings. It was special because there was a story behind each brooch. I also tied to the bouquet tied two tiny heart picture frames which held pictures of my grandparents, so when I walked down the aisle they were with me. 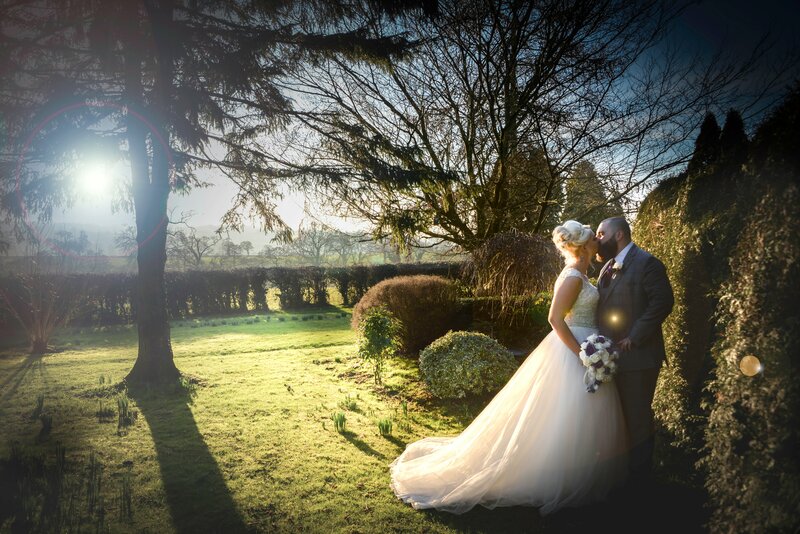 It was just something a bit different, and the brilliant thing is that whilst normal bouquets wilt, I’m going to have my bouquet forever, and easier because I could do it a long time in advance, and so knew it would look exactly how I wanted on the day, and it helped to achieve the no stress wedding that we wanted, as I was a job I could cross off the wedding list. I would say our theme was vintage. I wanted lots of classic textures, like lace, ribbon and pearl, which were on my dress, our cake and the table decorations. 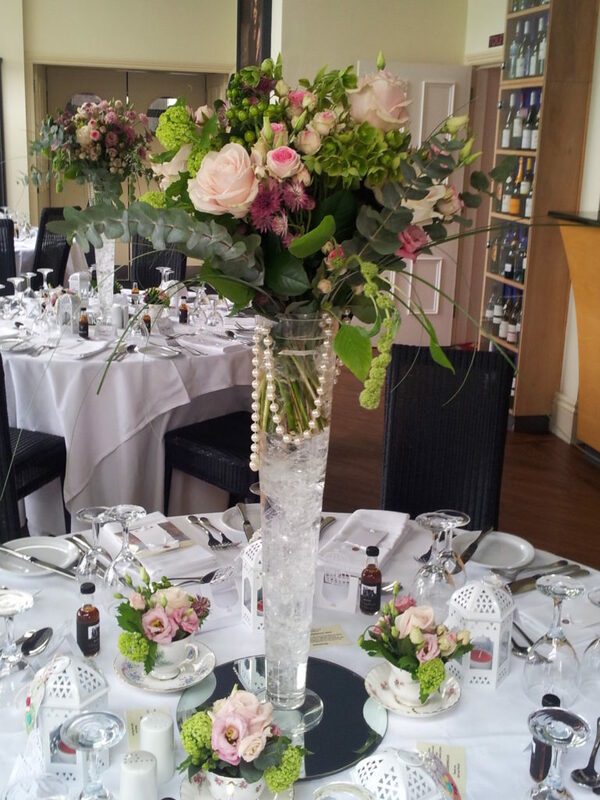 We also had flowers in teacups and tall glass vases for the table centre pieces, and the favours were vintage themed too. I walked down the aisle to a song called ‘The Flower Duet’ which I thought was appropriate in my line of work, and it was the version sung by Charlotte Church. I remember feeling so excited, not at all nervous as how I thought I would be, and I just couldn’t stop smiling. My wedding ring was a palladium band with Princess and Baguette cut diamonds, from Chisholm Hunter Jewellers in Nottingham, and Karl’s was a palladium band from England Barker Jewellers in Ripley. We had two lovely readings; I’ve got three sisters all together, and two of them spoke. I had my twin sister to be a witness when I signed the register, and Karl had his best friend Mark. I wanted to keep the ceremony traditional, it was short and sweet. As we walked out we had Stevie Wonder playing, “For Once in my Life”. We had some canapés and champagne, but as the wedding was at 3pm, we were quite late into the day, so we wanted to get straight into the swing of things. The speeches were brilliant and well received l. As my Dad has already done three wedding speeches in the past for my sisters, he has had lots of practice. His speech was fantastic, with lots of good jokes. We made all the stationery and invitations ourselves. That was the key thing about the day, all the little personal touches and little surprises, like lovely gifts for the bridal party. For favours we left beautiful lantern tea light holders, with little floral print tags hanging off them. For the men we gave little bottles of Spanish brandy, as Karl’s parents currently live in Spain. We had 84 for the ceremony and the sit-down meal. We gave people the choice of two starters, two main courses and two desserts. It was funny how its seemed that the women went for one type of meal and the men went for another: most men has tomato soup, followed by sausage and mash and finished with profiteroles, whereas the women almost all had goat cheese, followed by chicken and finished with Eton mess. There was a slight variation, but this seemed like the majority vote. We had 120 at the reception. For the first dance, we swayed together for a minute to a typical first dance song, and then the lights went down and the DJ stopped the music, so for a while it looked like everything had gone horribly wrong. What the guests didn’t know was that for nine weeks before the big day, Karl and I met with the best man and the ushers in the local social club, where we had dance lessons and choreographed a memorable surprise for the guests. The DJ then said, in a robotic voice: “I think we have a technical problem”, and we broke into the YMCA, as we had practised! The ushers and best man came marching on out of nowhere, in the Village People outfits. We then did a medley, of Cotton-Eye Joe, Vanilla Ice, and finished on Gangnam Style, where we all had dark glasses on. We did it because we were trying to make it fun for the guests, and that went down really well, and got everyone on dance floor. The DJ, Danny Betts, was recommended from someone we know. He had a video screen with pictures of the stag do, and then pictures of my hen party, which gave everyone a good laugh. My mum made the cake, and it was a three-tiered stack. The bottom was wedding cake, the middle was chocolate, and the top was vanilla. 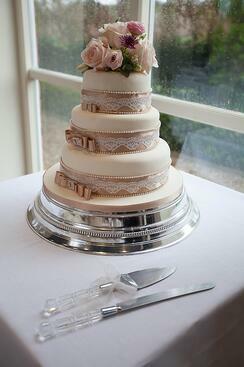 It was decorated with lace, ribbon, a bow and a diamante buckle, and fresh flowers on the top. Needless to say it was absolutely delicious, and we didn’t get to take much home with us after the guests had tucked into it. Our photographer was Geoff Curtis, who did a great job, and captured the day perfectly – his pictures speak for themselves. We went to the Dominican Republic for two weeks, and it was unbelievable. We went 5* all the way, so it was a real treat. We even went swimming with sharks and sting rays, and so whilst I was completely out of my comfort zone, I wanted to do something that pushed me to my limits. It was certainly unforgettable.